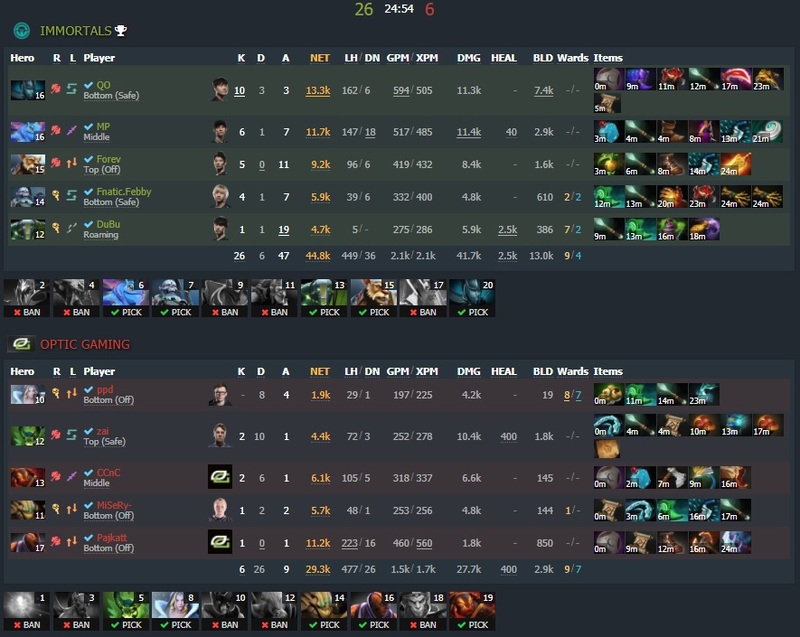 Immortals defeated OpTic Gaming 3-2 in the grand finals of AMD SAPPHIRE Dota PIT League NA qualifier. They will join seven more teams in Split, Croatia. Immortals are the only team in the NA qualifier that had to play the open qualifier, while the others received a direct invite. In the road to the finals, they beat Digital Chaos twice: in the semifinals and in the losers’ finals. They dropped there after failing in the winners’ finals against OpTic. The two teams faced each other anew in the grand finals, but this time Immortals ended the Bo5 as the victor, with a 3-2 score. Dota PIT League S6 will feature a total of eight teams, fighting for a $300,000 prize. Two received a direct invite, while the remaining ones must earn a spot through the regional qualifiers. Currently, only the South American finalists are missing. The first game was quick and ended at 26 minutes - OpTic scored 23-6. They maintained the lead at any stage of the game, and had almost no casualties in teamfights. Only Rasmus "MiSeRy" Filipsen on Nyx Assassin died a notable number of times during the mid game fights. Kim "QO" Seon-yeop played in the mid lane with Alchemist, and was able to collect a respectable amount of gold thanks to the help of his supports. Despite his successful farm, the enemy Templar Assassin was the real winner of the mid lane, and finished the match with a 10-1-7 score. Multiple small ganks took place starting from the 5 minute mark of game two. In the first 27 minutes we still didn’t have a clear victor, but OpTic lost a nasty teamfight at 29 that settled the destiny of the match. Immortals pushed, while picking off the opponent heroes one at a time, and won a final battle at 38 minutes that determined the end of the match. A swift victory for Immortals in game three. OpTic opted for an offensive trilane in the offlane, with Anti-Mage, Crystal Maiden, and Sand King. It wasn’t a bad idea as AM farmed, and PA died twice in the first 10 minutes, but it wasn’t enough to stop her. A great game for Kim "DuBu" Doo-young on a roaming Earth Spirit, who got 19 assists while helping his team. The enemy Pugna, in solo easy lane, was one of the most focused target by him and Lee "Forev" Sang-don on Brewmaster. OpTic won game 4, and the Bo5 tied to 2-2. Immortals had a difficult time farming their Sven in the easy lane as they were facing a Dark Seer. An offlane Venomancer was a wise idea versus Chaos Knight, but Peter "ppd" Dager on Lich dealt with him denying exp and harassing. 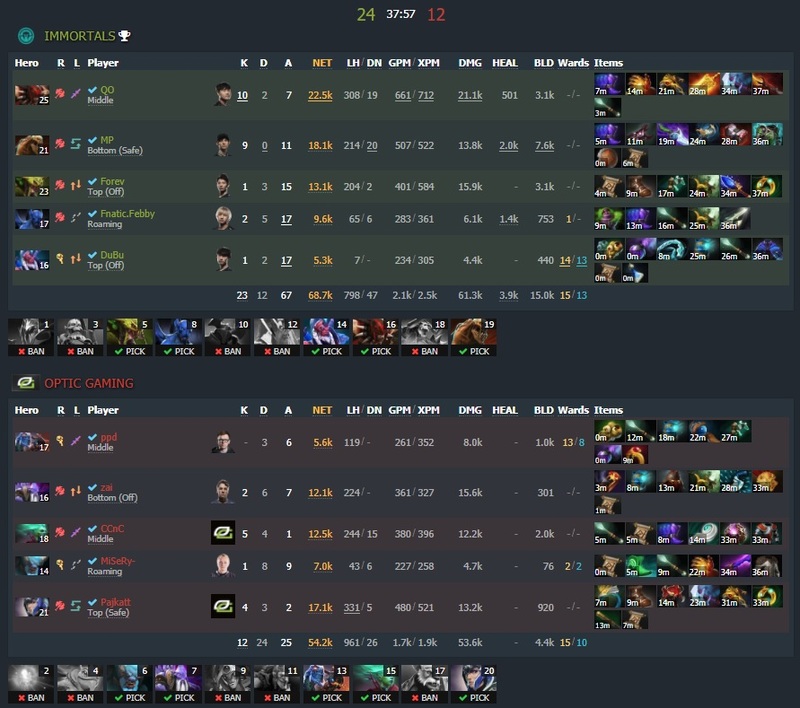 OpTic won with over 20k gold lead at 29 minutes, after having the upper hand in multiple consecutive teamfights. Quinn "CC&C" Callahan on Clinkz spread panic in the enemy lines, and thanks to a Black King Bar he could face Venomancer and Earthshaker without risking his life. Pyo "MP" No-a had a perfect game on Lifestealer, farming five items and ending without a single death. He and QO on Bloodseeker led the final battles at 35 minutes, during which OpTic lost three successive teamfight and the Bo5. Per Anders Olsson "Pajkatt" Lille was behind in farm with only 480GPM - Luna required more money and items to actually make the difference against the enemy carries. Immortals is a new entry in the world of Dota 2, but the squad already qualified for their first LAN event: PGL Open Bucharest. Vici Gaming had a flawless run during the Chinese qualifier for AMD Sapphire Dota PIT League. All opponents were defeated without a single loss. Infamous earned a spot for PGL Open Bucharest Minor after triumphing in the SA qualifier. They defeated SG esports 3 to 1 in the finals. Team Liquid advanced to the playoffs of StarLadder i-league Invitational S3 Minor. They defeated Mineski in the first Bo3, and SG esports in the second. Virtus.pro are the champions of ESL One Hamburg 2017, the first Dota 2 Major of the new season. They brought home $500,000 and 750 Pro Circuit Points.